Survey data of single-family builders collected by NAHB at the end of 2013 reveal the share of builders who installed energy producing equipment in new construction, highlighting an important trend in home building. These are two types of property that provide a 30% federal tax credit (under tax code section 25D). Unlike the 25C credit (for windows, doors, and other energy-efficient property), which is only available for existing principal residences, the 25D credit is available for new and existing homes, and primary and secondary residences (except for fuel cells, which can only be claimed in connection with a principal residence). 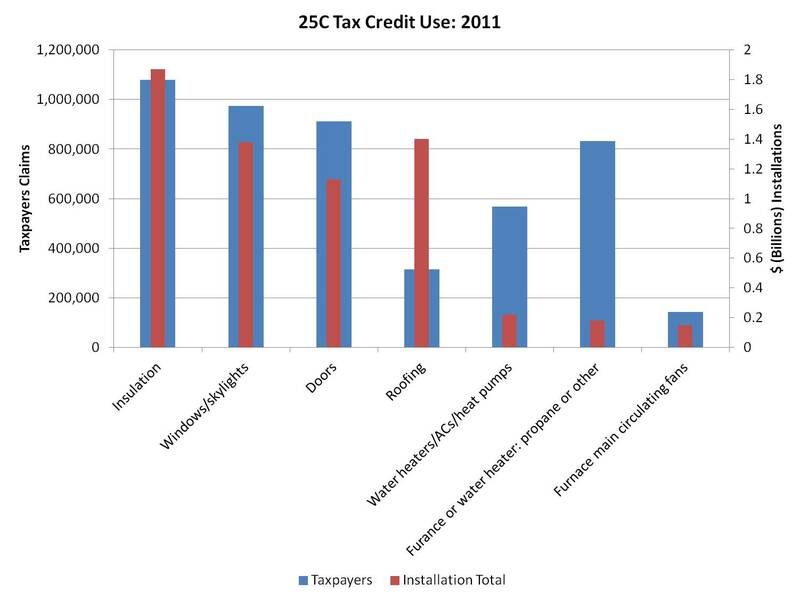 Like the 25C program, the tax credit is claimed by the homeowner/homebuyer. The 25D credit is scheduled to remain in law until the end of 2016. 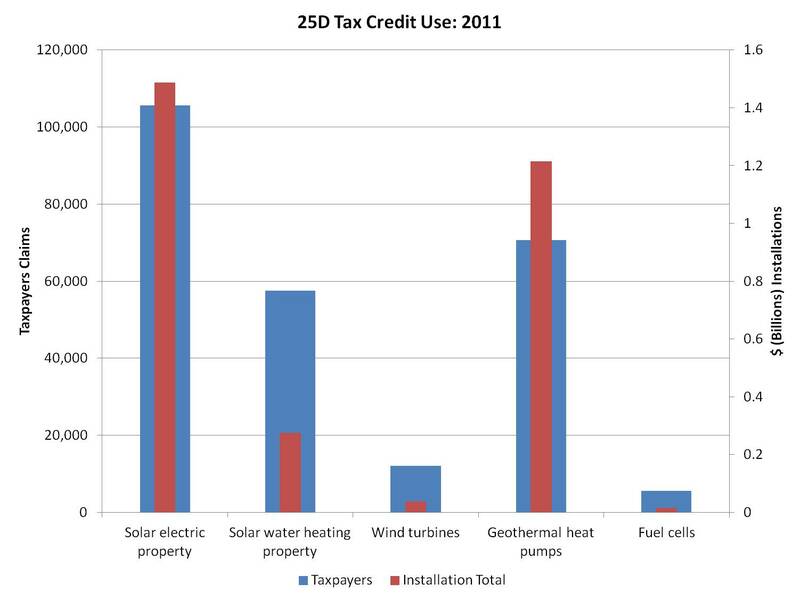 The 25C credit expired at the end of 2013, although it may be extended along with other “tax extenders,” later in 2014. Another trend the NAHB survey revealed is that even for new homes not possessing solar panels and other power production equipment, design choices are being made to enable future installation. Of those 77% of builders who answered “no” to the question of power production property installation, an additional 23% (nearly 18% of the survey total) built infrastructure that would allow the homeowner to install the power producing equipment easily in the future (e.g. conduits for wiring the electric system to solar panels). The combination of currently installed property and infrastructure accommodation for future installation suggests a trend in builder practices that will allow homes to produce some, or all, of their own power. However, it is important to keep in mind that mandates associated with these practices should be avoided because such installations will not be cost-effective or match consumer preferences in all markets and for all homes. 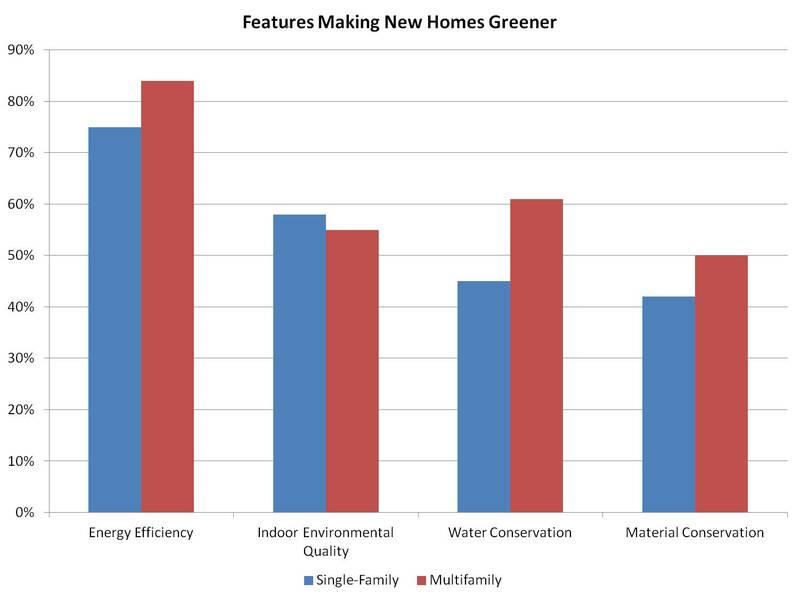 A study published in June presents evidence in support of NAHB’s policy, which classifies a change in building codes as cost effective if it returns at least 10 percent in energy savings the first year. The study argues that a common alternative to NAHB’s policy, using the current mortgage rate to evaluate energy efficiency, is an unrealistic assumption and produces unrealistic results. In particular, taking the mortgage rate to be representative of the rate of return home buyers require fails to capture borrowing constraints and doesn’t reflect the way buyers actually evaluate alternatives when deciding on which features to include in a new house. 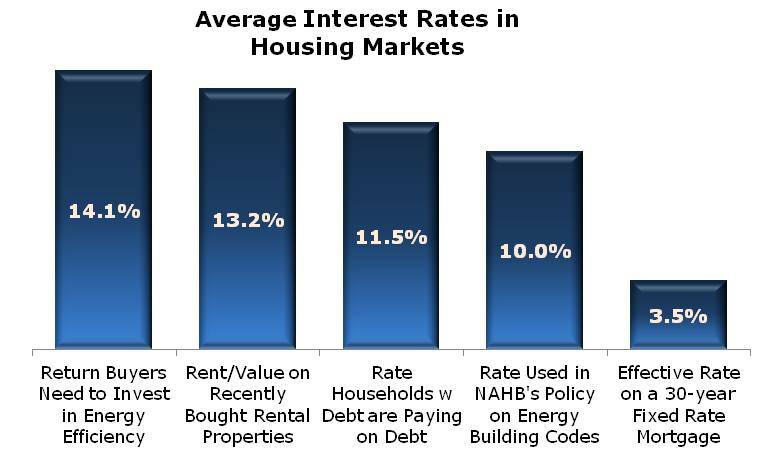 The study presents evidence from three different sources indicating that the rate of return that drives most home buyer decisions is much higher (summarized in the chart below). Notice that the 10 percent return in NAHB’s policy is slightly below the rates from these three sources, but is at least in the general neighborhood. The current mortgage rate, on the other hand, is far too low at under 4 percent. Using a rate this low to evaluate savings on utility bills will classify as cost effective some features that are clearly priced higher than the market will bear. 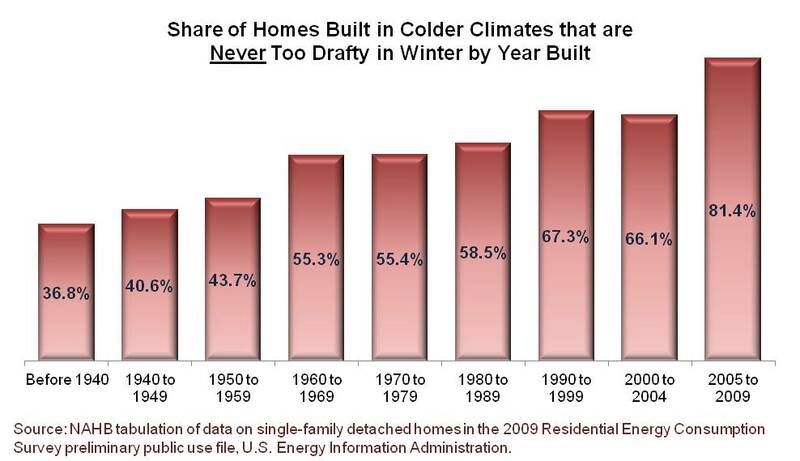 This doesn’t mean that home buyers are apathetic about energy efficiency or are unwilling to pay for it. NAHB’s latest consumer survey provides clear evidence that home buyers care about energy efficiency and are willing to pay for it. But there are limits on how much they will pay up front relative to the annual savings they can expect. The study also shows that rates of return should be higher at the affordable end of the housing spectrum—where first-time buyers and buyers with modest incomes are likely to be living paycheck to paycheck and therefore need a higher return in exchange for an immediate sacrifice. Further details, including documentation of data sources, are available in the full study. The Residential Energy Consumption Survey (RECS, produced by the Energy Information Agency in the U.S. Department of Energy) collects information on various housing characteristics, including the age of the structures. Although the actual energy consumption data has not yet been released, a RECS data set containing a considerable amount of ancillary, related information is available. For example, answers are available to a subjective RECS question asking occupants if their homes are “well,” “adequately” or “poorly” insulated (homes with no insulation at all are a separate, but rarely checked category).